Trigger Point release therapy is a form of treatment, usually administered by trained massage therapists, that requires a great deal of knowledge on the Musculoskeletal system as well as the ability to feel a difference in the density and texture of muscle tissue. 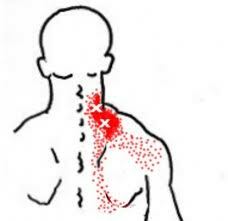 Trigger Points are a form of knots in the muscle that referrers pain to local and distant areas of the body. This is called referred pain. Muscle fibers run parallel with each other and Trigger Points are spots in the muscles where the fibers have become bunched up and look more like a pot of cold cooked spaghetti. As the same with cold spaghetti, these fibers can become glued together which then can reduce your movement and require a therapists to break them apart using a direct and focused pressure. Once the fibers have been separated from each other, the therapist then realigns the fibers to be parallel and in their proper direction. There are about four hundred muscles in the human body and any one of them can develop several trigger points, potentially causing referred pain and dysfunction. 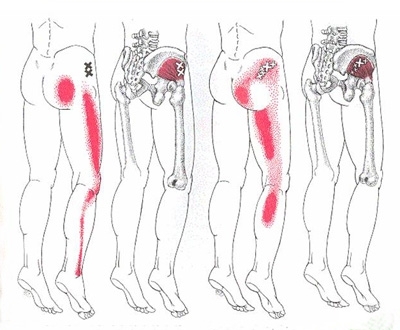 Symptoms can range from intolerable, agonizing pain to painless restriction of movement and distortion of posture. - Around 75% of pain clinic patients have a trigger point as the sole source of their pain. - Arthritis is often cited as the cause for pain even though pain is not always concomitant with arthritis. The real culprit may be a trigger point, normally activated by a certain activity involving the muscles used in the motion, by chronically bad posture, bad mechanics, repetitive motion, structural deficiencies such as a lower limb length inequality or a small hemipelvis, or nutritional deficiencies. - The following conditions are also frequently misdiagnosed as the cause of pain when trigger points are the true cause: carpal tunnel syndrome, bursitis, tendonitis, angina pectoris, and sciatic symptoms, along with many other pain problems.